What is the current environmental condition of European seas? What are the status, trends, pressures and impacts affecting the environment of European seas? The Marine Strategy Framework Directive (MSFD) requires Member States to assess the current state of their marine waters (the initial assessment). This report ('Current state of Knowledge on the Sustainability of European Seas') presents a summary of the information describing status, trends, pressure and impacts that is available to the Member States with relevance to each of the four European regional seas. The applicability of available information to Good Environmental Status is demonstrated using an assessment of the linkages between ecological characteristics, pressures, impacts and each GES descriptor. This can provide useful baseline data for other purposes, such as MSP. The key objective is to produce scientifically-based operational procedures that allow for a step by step transition from the current fragmented system to fully integrated managements. ODEMM focuses on the structure, tools and resources required to choose and evaluate management options that are based on the principles of Ecosystem-Based Management (EBM). It is essential to have information on human activities and their pressures. A pressure assessment approach developed by the ODEMM project was used to evaluate the mechanisms through which human activities have an effect on the marine ecosystem. Pressures can be physical, chemical or biological and the same pressure can be caused by several activities. ODEMM identified 106 activities from 19 sectors, in Europe’s regional seas, and attributed 25 specific pressures to those activities including both current and emerging threats to ecological characteristics. A combination of published literature and regional expertise was used to evaluate the extent and frequency of overlap between each sector-pressure (e.g. fishing- abrasion) and predominant habitat type (EUNIS 2 classification) within each regional sea. Each sector-pressure-predominant habitat combination was evaluated using three criteria: (1) degree of impact of the pressure on the habitat, (2) habitat resilience (recovery potential), and (3) the persistence of the pressure beyond cessation of the activity causing it. Highest threat combinations were described using pre-defined combinations of extent, frequency, impact, resilience and persistence scores. High threat combinations that arise from four sectors, namely agriculture, coastal infrastructure, fishing and shipping, were identified as being common to all regional seas. ODEMM developed a risk assessment approach to determine the likelihood of failure to achieve GES under present conditions. This approach used information collated by regional sea experts that describe the status and trends of ecological characteristics and/or an assessment of the pressure associated with activities occurring within the region and assessed against criteria that described the risk (high, moderate or low) to GES. Risk criteria, in conjunction with a working definition of GES, were developed by the ODEMM project, providing an approach to compare risk among descriptors and regional seas. Of the 11 GES descriptors, 5 were classified as currently being at high risk of failure in all regional seas, namely: Introduction of non-indigenous species, Commercial fish and shellfish, Foodwebs, Seafloor integrity and Marine litter. The risk assessment framework also indicated high likelihood of failure to reach Favourable conservation status (FCS) in the Baltic Sea, Mediterranean Sea and NE Atlantic. The ODEMM project recognises that the likelihood of failure to achieve GES is not only constrained by ecological characteristics. It is necessary to integrate social and economic growth with the natural environment to understand how GES can be achieved in each regional sea. Member States face a dichotomy of needing to implement programmes of measures to achieve GES for regional seas while concomitantly addressing policies which aim to develop sustainable social and economic growth. 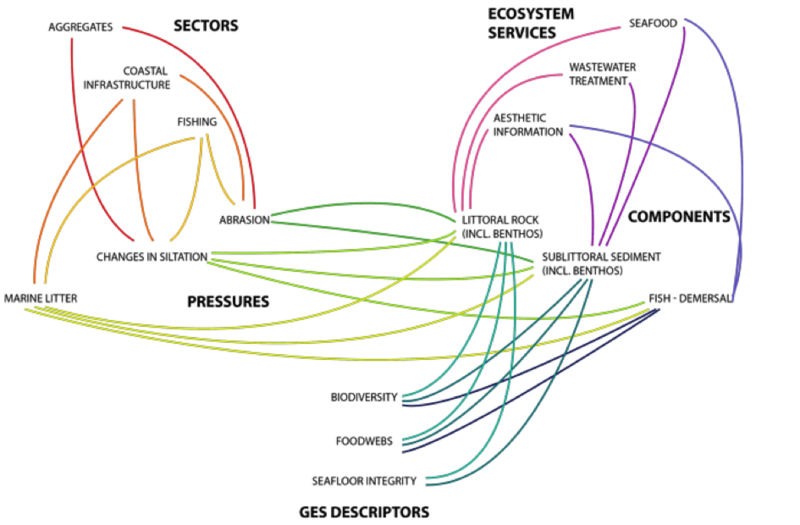 ODEMM addresses these issues by proposing a linkage framework which illustrates the connectivity between the natural, social, economic and political components of the marine ecosystem. The linkage framework incorporates the principles of ecosystem-based management (EBM), the three pillars of sustainability and the DPSIR (Driver-Pressure-State-Impact-Response) approach. The linkage framework provides a means to fully evaluate all components and their relationships that can affect our potential to achieve GES in a fully integrated ecosystem assessment in each European regional sea. The report provides a knowledge base describing the current environmental status, trends, pressures and impacts relating to European regional seas, with transferability to the need to describe marine conditions and issues for MSP exercises. ODEMM was funded by the European Commission under the 7th Framework Programme between 2010-2014. Direct costs of this practice's elaboration are unknown.